This page gives full circuit details of 4QD's commercial battery condition indicators. for 24v operation, but can be built for 36v as well. For 36v. Another build is available for 48v. It is of course quite possible to alter the operating voltages of the circuits. This is by far the most popular circuit of the three, so we will start with that. It's a very simple circuit - but one that is extraordinarily reliable and very repeatable as a production item. Tr6 and 7 form a current source. Tr6's collector delivers 30mA to the line of LEDs, which are shorted out one by one, by the transistors Tr1 through Tr5. With no voltage across R6, just enough current flows through D1 and then through R5 through R1, to keep all transistors turned on. With these all conducting, no current can flow through the LEDs which are therefore all extinguished. The voltage on the top of the LED chain (Tr6's collector) will be defined by the sum of the voltage developed across R1 through R5, plus D1's voltage drop. Of course, R1 through R5 will each have 1 Vbe across them, as their voltages are defined by the base turn on voltages of the transistors. As the input voltage, Vin (red arrow) rises, so will the voltage across Tr2 through Tr5. The collector voltage of Tr1 is however clamped to B- because the 30mA current (generated by Tr6 and Tr7) is flowing through it. So, when the voltage across L5r gets high enough it will start to glow. Now the voltage on Tr2's collector starts to be clamped by the voltage across the turned on LED. There is a voltage band during which the current in the LED is rising, but as soon as the full current of 30mA flows through the LED, that's it. The voltage on Tr2's collector can rise no further. A small additional voltage rise now can occur before enough voltage is present across Tr2. When that occurs, L4r starts to glow and the turn-on cycle occurs for R4. And so on until all LEDs are fully illuminated. You should see from this that the voltages for the start of illumination and fully illuminated states of the LEDS are all defined by the Vbes of the transistors and the LED voltage for 30mA of current. All of these voltages are actually very well defined and very repeatable for modern semiconductor devices. It is true that different LED technologies and colours do have different values, but in practise, high brightness LEDs are all very similar, be they red, yellow or green. But if you want accurately defined voltages, you need to be aware of that possible variation and choose devices with due consideration. There is temperature variation in semiconductors: at room temperature, transistor Vbe decrease by about 2mV per °C. LEDs also have a similar response, though the value is seldom quoted. In practise, the two tend to cancel out and the temperature drift of the final circuit is therefore reduced. So the meter has a fairly linear voltage range at the point Vin. This is connected to the battery positive via a 9v1 zener, to shift the useful display range to the correct value for a 24v battery. It is of course possible to alter the circuit. The zero point can be shifted up or down by altering R7. The battery voltage can be shifted by altering the zener voltage. You cannot use the 5 LED voltage on 12v - there's not enough voltage to illuminate all LEDs. 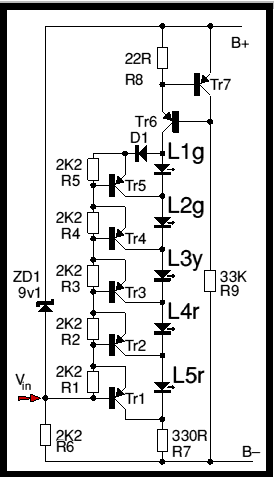 But you can increase the supply voltage - the limitation will usually be the dissipation in Tr6 which gets quite significant above 24v. Also, the span of the simple circuit is determined by the number of LEDs. A higher battery voltage requires a greater span, so more LEDs. This is a list, complied from our own in-house parts lists, of the components needed to build the circuit. Note that I have given 4QD's in-house part number for reference, but this does not imply that 4QD are prepared to sell the components! This LED meter can be changed to 36v easily. The only change is the zener diode which (was 9v1 for 24v) changes to 20v. Hardly a surprise, the 7 LED circuit is almost exactly the same as the 5 LED version. The most notable change is that the main current source transistor is now a TO5 type, with a suitable heatsink. It is supplying 30mA and may have over 40v drop, so is asked to dissipate 1200mW. The components generally are so similar to the 5 LED, it seems scarcely worth listing separately. The three LED is a little different! You will notice that the current source is in the other end of the LED chain. Or, to be more exact, the LED chain uses NPN transistors, so is upside-down, with the current source still in the positive. There is also now an input transistor, Tr1, as the phasing of the control signal is now inverted.